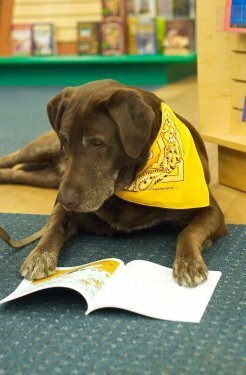 Reading w/Rover Today – Therapy Dogs Helping Kids Read! There’s nothing worse than being made fun of when you’re trying your best. It makes you want to just give up and that feeling sticks with you. Us dog lovers know that dogs don’t judge, love you no matter what, and look at you in a way that makes you believe you can do anything. That’s the idea behind reading therapy dogs. One of the best ways to learn how to read is by reading out loud. Kids who have trouble reading can read to therapy dogs and work on their reading in a safe environment filled with doggie support. Today, Saturday, September 22nd, therapy dogs and their handlers will be at the Edmonds Library to listen to children read aloud. For information about the event visit the Reading with Rover event page. Posted in Community Event, Dogs, Seattle, Therapy and tagged children, dogs, non-profit, reading, therapy dog. Bookmark the permalink.